"We use the SimpleTester extensively when we do conformance testing of our SNMP agent implementations. It has saved us a lot of time. I really like the ease of use of the product." SimpleMIBEditor™ is an easy to use, graphical tool that simplifies the process of creating SMI conforming MIB definition files without requiring the user to be an ASN.1 specialist. SimpleMIBEditor creates new SNMPv1 and SNMPv2 MIBs, automatically corrects many common errors in existing MIB defintion files, and also converts MIBs from one SMI to another. SimpleMIBEditorPro is an easy to use, graphical tool that simplifies the process of creating SMI conforming MIB definition files without requiring the user to be an ASN.1 specialist. After helping with MIB creation, it also assists in building a Net-SNMP based SNMP Agent by creating stub interface functions required to link the MIB variables to the underlying instrumentation. SimpleMIBEditorPro creates new SNMPv1 and SNMPv2 MIBs, automatically corrects many common errors in existing MIB defintion files, and also converts MIBs from one SMI to another. It also provides a graphical interface to create interface functions and provides Tcl based code generation files that can be modified if required. 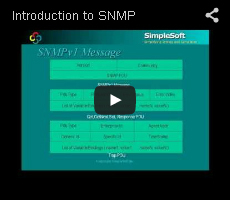 SimpleSnmpTcl™ is an easy to use Tcl package that provides a set of application commands to communicate with a network management agent using the Simple Network Management Protocol (SNMP). It supports all versions of SNMP (v1,v2c and v3). It also supports IPv6 in addition to IPv4. Using this package, you can quickly create standalone management applications that use SNMP to retrieve and configure information on agents. A trap interface is also supported. The document includes sample scripts that can be used as templates to create your own applications.